Years ago (well after Confederation) when Canada was different - Alyn Harington was born - glorious and free in downtown Toronto. After grinding through the Ontario public school system – he entered the ranks of a working stiff in a dead-end job. Well – that wouldn’t do – and so for years, chugged through Business Administration at college at night to improve his skills. Alyn eventually graduated in Business Administration – but only by supplementing the dry commerce stuff with a hefty serving of Second City Improv thrown in. Somewhere along the way – he married and had a family and got a real job. When time permitted – he dabbled in stand–up - Yuk Yuk’s and such. But it was Improv that got Alyn’s heart glowing and he hooked up with Improv groups in the area like : Flammable Oysters, Prescription-for- Laughter and Not-Just-Improv. Plying his trade, Alyn never lost the love of his home and native land and enjoys canoeing across a hidden lake in Algonquin park as much as sharing a stage and microphone. On stage, he played the romantic interest in "A Bed of Garlic" a play he produced in 2000. 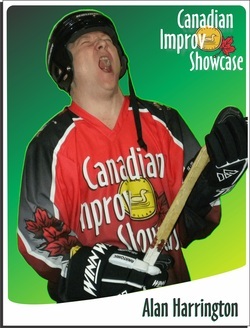 He has performed Improv at the Markham and Richmond Hill fairs and for Out-of-the-Cold program. 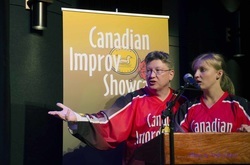 Alyn teamed up with the Canadian Improv Showcase in 2001 - bringing his twisted sense of the abnormal with wit and his love of the true north. Like he says… "Canada – it’s more than just Canadian stuff…"